In honor of the sixtieth anniversary of the founding of the People’s Republic on October 1st, my friend Carsey Yee has sent another video: The Two Chinese Characters do the March of the Volunteers (twice, once with English subtitles). I was a bit surprised to learn that the song predates the PRC by over ten years, that the author was arrested and the song banned for a time (Can anyone think of another case where a national anthem was banned without a regime change taking place? ), and, of course, the lyrics changed during the Cultural Revolution. I suppose it makes sense: the history of the song really is the history of China. A couple of years ago before I left for a trip to China an imperial princess told me to get a picture of a panda. I pointed out that there were a zillion pictures of pandas on the web, so there was no point in my trooping out to a zoo to take another picture. Ahhh, but none of those pictures were taken by Daddy. 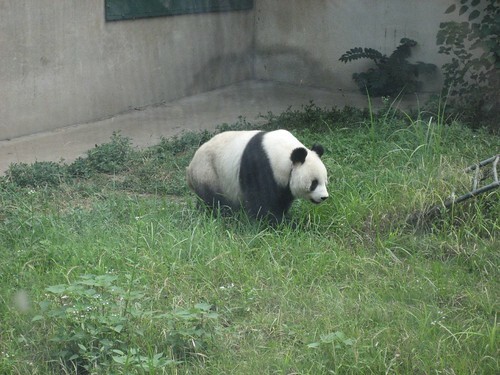 Obviously China=pandas, and the only good reason to go to China is to see pandas. This is actually a pretty widespread attitude. Now some grumpy Englishman says that we (by which I assume he means ‘China’) should “Pull the plug” on pandas. Far too much money is spent on them, and there is almost no hope them ever becoming a wild species again. Mostly this is just typical grousing about how large or cute animals get all the funding, and pandas are both of course. Jen Phillips, however, points out that there are things to do with pandas besides have them live in the wild (the holy grail of most conservation efforts.) The Chinese government makes a ton of money renting them out to zoos around the world, and they are a powerful symbol of China both internationally and domestically. Obviously the Chinese government is the one making the calls here, and they are not going to stop breeding pandas. The Imperial population of Pere David’s Deer, or Milu 麋鹿 was finally wiped out during the Boxer Rebellion, when foreign troops ate them. Some of the herd had been given to Europeans as diplomatic gifts, however, and from those the population was rebuilt. Apparently the Emperor’s herd had been isolated for so long that any bad genes had been bred out, and so you could re-build from a very tiny number of animals. Milu have been extinct in the wild for about a thousand years, and it is not even clear what their original range was.1 They surrvived for a very long time as imperial animals, however, and maybe pandas will too. I suppose it would help if they were better at mating. The people in the reading room at Shaanxi Provincial Archives are really nice and helpful and professional. Unlike some archives they will let you look at things that are not directly connected to your approved research topic. They will also let you drink tea right there in the reading room while reading documents. On the downside they have taken over half of the reading room to practice their song and dance routine for China’s upcoming 60th national day. Fortunately I, like everyone else, am so excited about the celebration that it does not bother me. I found a few documents on an American soldier who was busted for stealing cultural relics in 1945. Violation of cultural relics laws was a big problem in Shaanxi, and they have a fair number of documents on it going back to the 1930s. They don’t give his name, but apparently he was caught with an entire truckload of stuff, including 9 “Xia dynasty” bronze ding and 3 Six Dynasties Buddha images. Total value over 5 million yuan. By 1945 Americans no longer enjoyed extraterritoriality, so he was subject to Chinese law. On the other hand, members of the American military were governed by a status of forces agreement that gave them many of the same privileges. He did not cooperate or say much to his captors. I suspect if he had been caught with couple TLV mirrors in his backpack they would have just ignored it or maybe confiscated them. A truck puts him in Kelly’s Heroes territory, however, and they had to do something. Of course this guy could have regularized his actions without too much trouble. Lots of American China collections, most notably the Harvard library were built up during or right after the war by having Americans with money and official connections go around buying up everything they could get their hands on. One assumes this soldier was not digging this stuff up himself, he had Chinese accomplices (not mentioned here) who were helping him because he had lots of greenbacks. Of course that is totally different than say, Fairbank, tossing around Harvard money, since he was buying up Chinese culture in a poor and disordered country -with- official permission, and with a scholarly purpose, rather than for personal aggrandizement, and this guy was doing the opposite. Plus the soldier did not have a Ph.D. As so often happens in archives the documents end before the case is resolved. The last document is from the provincial government, asking if maybe the artifacts are fakes, perhaps as a way to sweep the incident under the rug. Too bad, since a trial might have generated more statements about what actually went down. Thus you end up with something like this. Nice firm mounting, easy to read, and easy to preserve. They are also doing computer print-outs of all the tables of contents in each folder. At present these are hand written, and most of them are fine, but some of them seem to have been done by budding master calligraphers. On others you can see the handwriting get worse as the copyist gets bored. Now they will all be nice and machine printed. You might think they were on their way to digitizing the whole collection. Indeed, here is a lady doing scanning for the digitization process. Here are people entering keywords. Soon, not sure how soon, the whole archive will be digitized, and you will be able to call up stuff from anywhere. 2009 marks the 100th anniversary of the New Policies (新政) reforms of the late Qing. Well, not really. The Late Qing reforms are increasingly seen as more important even than the Revolution of 1911 in creating a new China. A modern government with modern departments was set up, there was a budget, modern schools were built, etc. The began sometime after the Boxer uprising of 1900 and lasted till 1911. The Revolutionaries found themselves taking over a much more modern Chinese state than had existed a decade before. 1909 is actually a little late as a date, but I am using it here because it seems like all the major libraries in China are celebrating. I was at the conference for the National Library in Beijing’s 100th. It was a big deal. Mei Baojiu performed and I got to see him. Then I come to Shaanxi and the Provincial library is also having its 100th. This was a bit annoying, since they were setting off fireworks outside the reading room and I wanted to stick my head out the window and yell “This is a library, darn it.” but I figured it would do no good. I assume people all over China are finding it hard to get any reading in as explosions and long-winded speeches interrupt the quiet. Both libraries of course started out as New Policies institutions. I’m not sure how it is with other cultural institutions, but Chinese universities are always very status conscious about how old they are, and people always ask when my university was founded and are quite impressed when I say 1875. That makes us older than Beida! Below are a couple of pictures of the gifts that Shaanxi library got on its birthday. I particularly like the boat Qingdao sent. Comments Off on Happy Birthday New Policies! Guess who’s in Bejing! Well, not me anymore since I just left1 I snuck away from my conference for a bit to go to the Confucian temple and the Yonghe temple, neither of which I had seen in years. Yonghe is still pretty much the same, although 15 years ago there were not so many stores clustered around it selling incense and Buddhist tcotchkes. Actually, I think 15 years ago there were basically none, and now there are zillions of them. 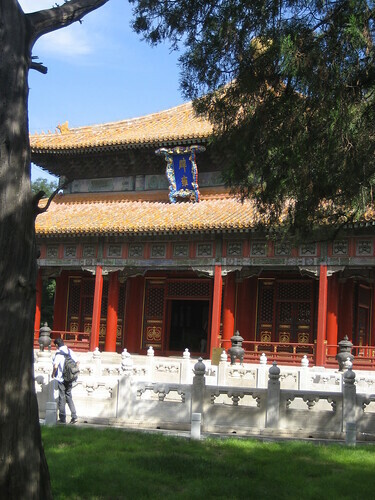 The Confucian temple and the adjacent Imperial University were more interesting however. Last time I was here they were pretty sparse, and there were not many people there. There were still not many people. Confucian temples are always nice and quiet, and a nice place to look at old trees. The exhibits had been updated, however, and there was a lot of stuff on Confucianism and its role in Chinese society. Since I like public history it was interesting to me, especially since most Chinese my age would have gotten no Confucianism at all in school, so it was cool to see this attempt to retro-fit it into the visitors. As you might expect, Confucianism was not really shown as developing, it was just created and remained unchanging, and the ascribed the ideas of a lot of later Confucians, or just Chinese customs, to the Big C. Confucianism was the essence of Chinese society, and still is (Which was not what they would have said 15 years ago) and Confucius inspired both the scientific method and the industrial revolution. Like most of these “”5000 years of culture Hooray!” things it was pretty overdone, but still very professional and detailed. They are getting pretty good at this. 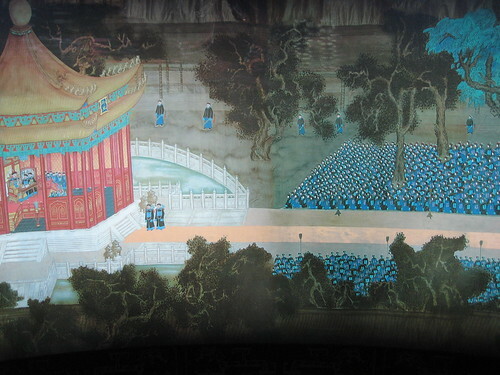 In the University they had an exhibit of sorts on the Qianlong emperor’s lectures to his officials, which happened here. 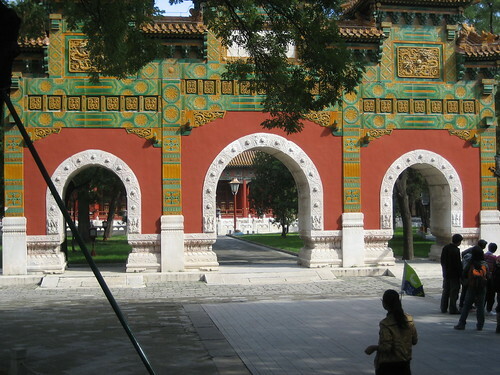 You may not have know that Qianlong was actually a teacher. Here is his office door. Hmm. Seems a bit ornate for a Faculty member. Of course, Qianlong was really an Administrator, so I guess even if he did give the occasional lecture you might expect him to be a little better taken care of than the average temp. 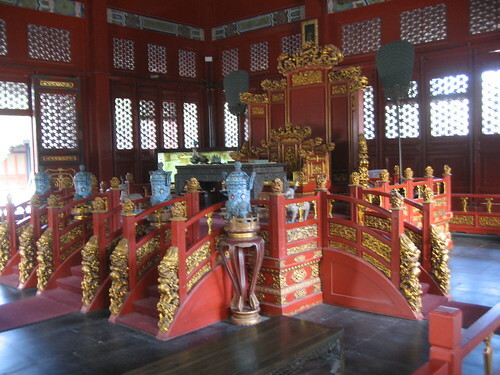 One thing I wondered about was if these lectures were a Qianlong innovation. I don’t think I have read anything about them, and I have read that Chinese emperors were quite different from Early Modern European monarchs, in that the Europeans were constantly on display and performing ritually in front of the ‘public’ (mostly the court). Chinese emperors were supposedly far less in the public eye, and these lectures would seem to be something that would tie in with the Southern Tours and other aspects of Qing imperial performance. Maybe I will check Zito when I get home.